It's frozen rosé, aka fro-zay baby! I have to apologise for two things in this short video. One is that I stole one of my kid’s lunch boxes to freeze the wine. SOZ! The other is that I make a really lame joke at the end of the video that I’m not sure anyone will get. I think it’s my version of a dad joke. Email me at dani@danivalent.com if you get it – this will make me feel better! 1. Make a light sugar syrup by placing sugar and water into mixing bowl and heating for 4 min/100ºC (212°F)/speed 1. Remove Thermomix lid and allow syrup to cool (approx. 5–10 minutes). 2. Add frozen rosé, frozen strawberries and lemon juice to mixing bowl. Blend 40 sec/speed 9. 1. Make a light sugar syrup by placing sugar and water into a small saucepan and heating until sugar has dissolved. Allow syrup to cool (approx. 5–10 minutes). 2. Place sugar, frozen rosé, frozen strawberries and lemon juice into a blender and blend until smooth and slushy. Pre-prepare the sugar syrup and frozen wine and you’re just one minute away from Emergency Frosé. I’m a fan of Matilda’s Frozen Fruit. They don’t give me anything to say that but I like that their fruit is Australian-grown and snap frozen in facilities used only for fruit. Try spiking the Frosé with Cointreau or vodka if you’re feeling really racy. Try serving Frosé with cubed melon sprinkled with Chilli & Lime Crumb. Subscribers have access to more refreshing cocktails: there’s zesty Peach Margarita, fruity Watermelon Smash and Jesse Gerner’s aromatic Casa Daiquiri. I love my Leonard Street dress and Elk necklace! 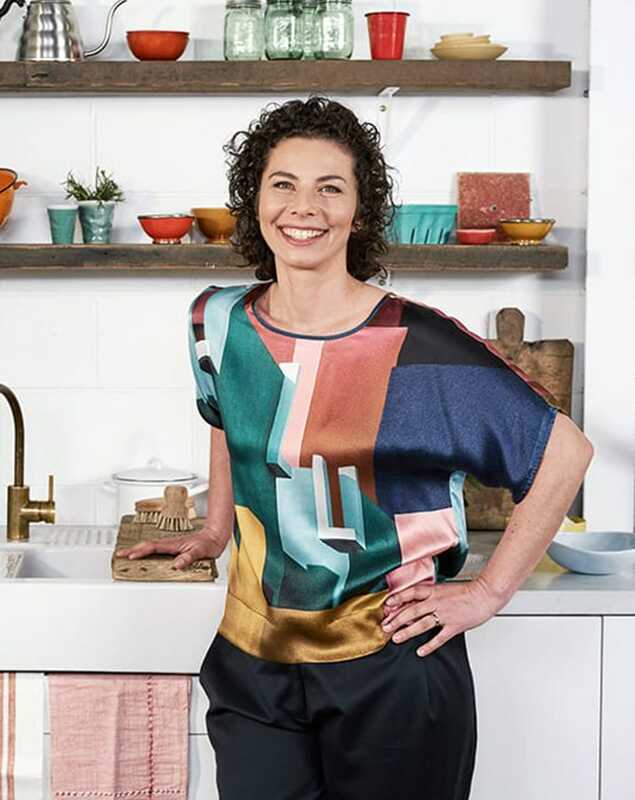 I wore another version of this print on ABC TV chatting about summer food safety. Check it out here.